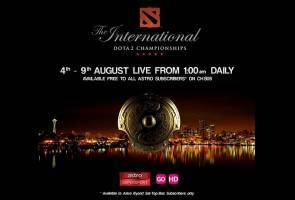 The International 2015 to be broadcasted LIVE on Astro SuperSport Plus Channel 808 & Astro on the Go. KUALA LUMPUR: Astro subscribers can now enjoy The International 2015 Defense of the Ancients 2 (Dota 2) Championships (TI5) for free on Astro SuperSport Plus Channel 808 and Astro on the Go from 4th to 9th August. This broadcast signifies the first live e-Sports offering from Astro. Viewers can enjoy eight hours of live matches daily, replays and exclusive content on Astro and on multiple devices anytime, anywhere via Astro on the Go. The championships will pit 16 teams in the game of Dota 2 for the total prize money of more than US$17 million up for grabs. Astro’s Head of Sports Business, Lee Choong Khay said Astro are honored to be the first broadcaster to offer a LIVE e-Sports TV channel in the region with the airing of TI5 Championships, the richest and respected e-Sports tournaments. "e-Sports is now enjoying booming popularity and we believe that the championship will be a big hit with over 10 million gamers in Malaysia,”he said in a statement. Marking the fifth year of the championship, TI returns to The KeyArena in Seattle, Washington. In addition to the live coverage, Astro SuperSport Plus will produce behind the scene views and follow the progress of Team Fnatic, an all Malaysian team exclusively invited to participate in the championships. Datuk Latt Shariman Abdullah, President of eSports Malaysia said, this is a very good opportunity to show to the whole world that e-Sports is recognized as a sports in Malaysia through eSports Malaysia (eSM). "We would like to thank Astro for taking the lead to bring eSports through the mainstream media reaching out to all Malaysians. At eSM, we hope that this coverage will ignite more interest amongst the gaming community as well as for sponsors to invest and be part of the e-Sports Industry in the future." All Malaysians can watch The International 2015 for free on Astro on the Go by tuning into Astro SuperSport Plus Channel 808 under LIVE TV tab to start watching. Astro on the Go is accessible via the web browser at www.astroonthego.com from a computer, or via the app on supported Android and iOS smartphones and tablets. Catch the Opening of TI5 live on Tuesday, 4th August, 2015 at 1:00am on Astro SuperSport Plus Channel 808 and on Astro on the Go. For more information head to www.stadiumastro.com.